Germans erected the death camp facility approximately five kilometers from the village of Sobibór, in the area adjacent to the nearby railway station. 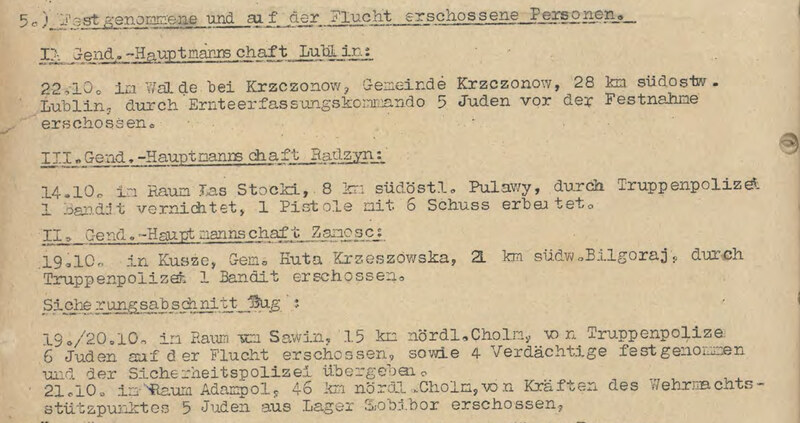 They divided it into the following sectors: camp foreground with the unloading ramp and quarters of the SS-men and camp guards (Vorlager); sector with workshops and residential barracks for forced laborers (Lager I); sector with a square where transports were processed and with facilities for sorting and storing property plundered from the victims (Lager II); and the extermination sector which housed the gas chambers and pits used for mass burials, and starting from late 1942 for cremating the victims’ bodies (Lager III). The German extermination camp in Sobibor was set up in a densely forested area by the Lublin-Chełm-Włodawa railway line. Formed in early May 1942, the SS-Sonderkommando Sobibor was first manned by Jews from the area of Puławy and then from other parts of Lublin District. Among them, there were Austrian, German, Czech and Slovak Jews who had been relocated to the Lublin region. Later, some transports with foreign Jews were directed directly to Sobibór. According to the report of the commanding staff of Operation Reinhardt, by the end of 1942, 101,000 were murdered in the camp. 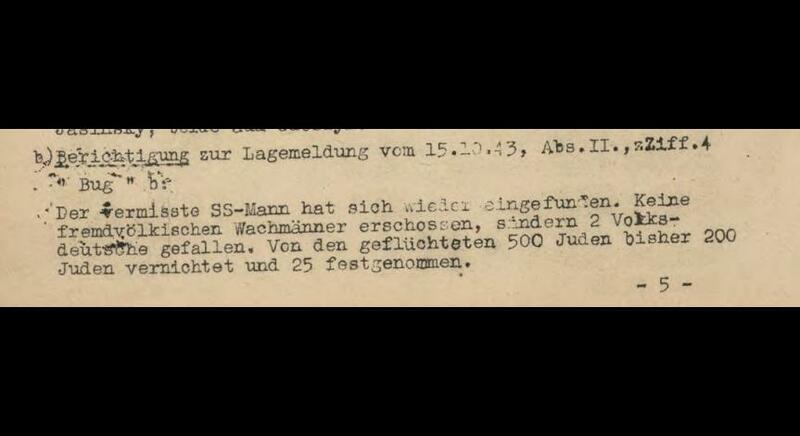 Some transports were subject to selection on the railway ramp: the SS-men kept alive only those capable of work. At first, only men were left alive; later, also women who were employed at the site or sent to labour camps. In Sobibór, they were employed in the workshop, did some cleaning works, extended the camp, segregated the victims’ property, unloaded transports. Some were incorporated into the so-called Sonderkommando stationed in a separate part of the camp (Lager III). They were forced to do the most gruesome work, such as clearing the gas chambers and burning the bodies. 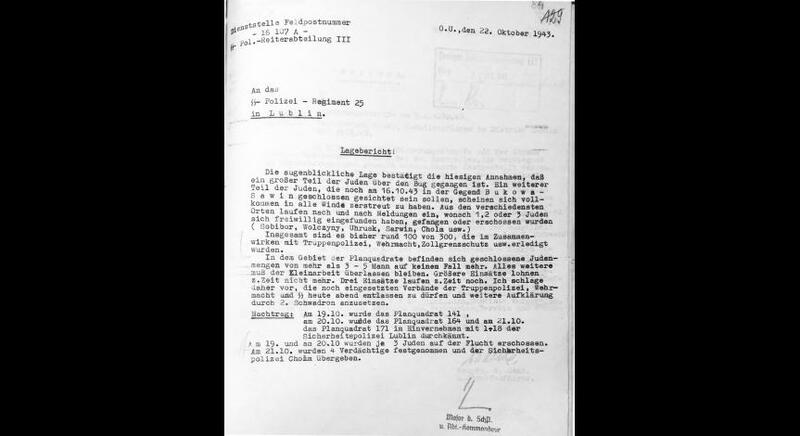 In the spring of 1943, Himmler ordered that transports from the Netherlands and France be directed to the camp. As a result, 38,000 people were brought to Sobibór in total. In September, several transports were sent to Sobibór from the Reich Commissariat East, including several dozen Red Army POWs of Jewish origin from the ghetto in Minsk. Later on, they played a key role in plotting and launching the revolt. As in other extermination camps, also Sobibór has its inner resistance movement. Initially, the idea of ​​revolting against the camp personnel came from the Polish Jews. 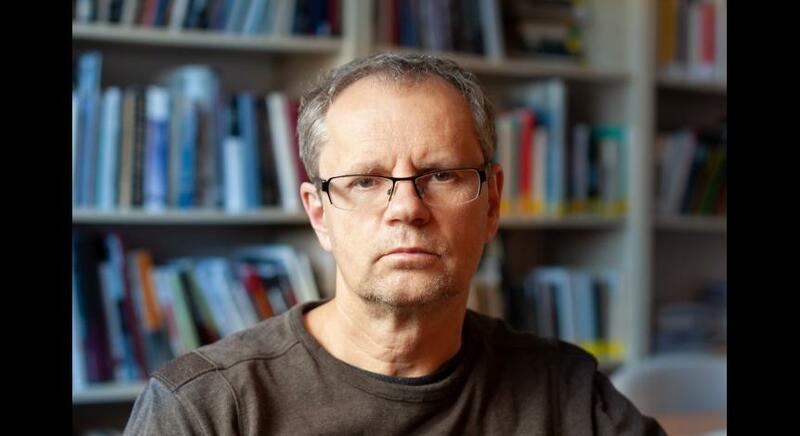 The group of conspirers was led by Lejb Felhendler, the former head of the Judenrat in Żółkiewka. Several options were considered, e.g. to poison the SS crew or plant a bomb in the canteen. The conspirers did not rule out seeking assistance from the Soviet partisans operating in the local forests but ultimately abandoned the idea as unrealistic. Also, the Dutch Jews, led by the naval officer Joseph Jacobs, were preparin an escape in collaboration with the camp wardens from Trawniki. They were betrayed and exposed, and the SS-men murdered most of the Dutch prisoners. However, there were several successful individual escapes. The situation of the prisoners changed fundamentally at the end of September 1943. This was when a group of Red Army POWs of Jewish origin were brought to the camp, among them Lieutenant Alexander Pechersky. Felhendler and Pechersky quickly found common ground. The camp resistance movement supported by the former Soviet troopers who knew how to use weapons made the idea of revolt more and more realistic. The scheme involved a secret elimination of all SS-men, seizing weapon and then forcing through the main gate. Then the escapees were to scatter to make the chase less effective and seek shelter on their own. The Sonderkommando members did not participate in the revolt as they were isolated from the rest of the camp. The revolt was planned to start at 3:30pm, 14 October. The circumstances favoured the schemers: the camp commandant, Franz Reichleitner, was away together with the greatest camp torturer Gustav Wagner. They acted according to plan: individual SS-men were driven to the workshop by prisoners who pretended to seek advice or assistance. 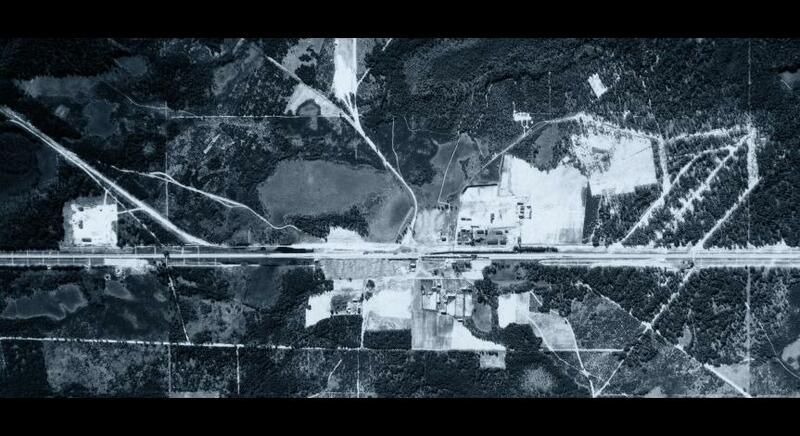 Once entering the facility, the camp staff were killed one by one and their bodies hidden. Another major step was to cut off the power supply and communications to prevent the SS-men from calling in reinforcements. At about 5:00pm, the prisoners, like every day, turned up for the roll call in order not to arouse suspicion. Pechersky yelled, “Comrades! To the gate!,” which meant a call for a revolt. Most prisoners scattered, many panicked and did not even attempt to escape. According to the plan, the core group began to push towards the main gate of the camp, while some others headed to the armoury where they managed to collect some weapons and ammunition. The guards manning the watchtowers and those standing behind the barbed wire opened fire. The prisoners were shooting back. The commandant of Lager I, Karl Frenzel, and several other Germans escaped death. The Jews were forced to retreat under a hail of bullets. The only way of escape was through the barbed wire fence and the minefield behind it. 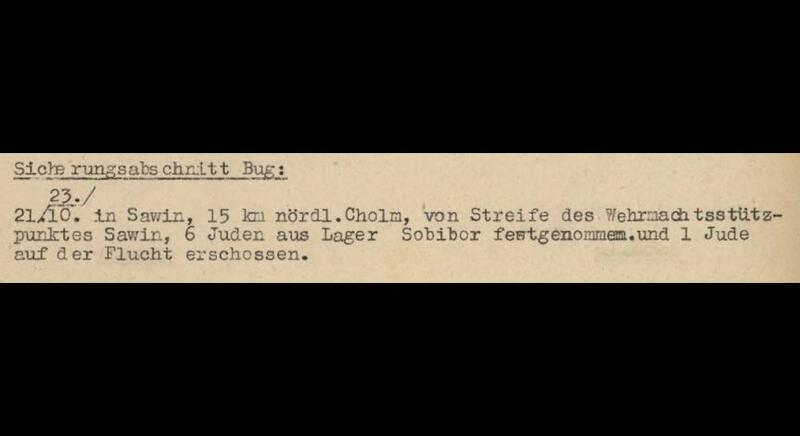 As it was getting dark, 300 prisoners managed to flee, leaving 40 behind dying in combat or on the minefield. Next day, Globocnik’s successor, Jakob Sporrenberg, the Commander of the SS-Police in Lublin District, arrived in the site and ordered the execution of all Jews left in the camp. 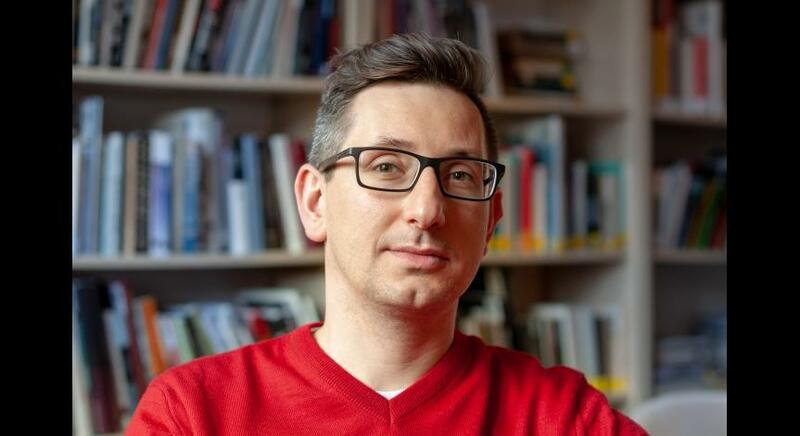 According to one of the reports of the Border Police in Chełm, “it was necessary to use arms when searching the camp because the prisoners resisted” (J. Schelvis, Sobibór, A History of Nazi Death Camp, New York 2007, pp. 179-180) . A search began by the Police, Gendarmerie, Wehrmacht and even the Border Guard units. Until early November, the majority of escapees were captured and murdered. 50 of them survived the war, including Pechersky and Felhendler. The uprising and escape of Sobibór prisoners, coupled with the death of the majority of the SS personnel, led to the decision to liquidate the camp, which had already played its part in the extermination plan. Several hundred Jews from Treblinka were brought to the site to dismantle the buildings and obliterate the traces of mass murder. They were all executed after the work was completed. Between May 1942 and October 1943, about 180,000 people were murdered in Sobibór: children, women, and men. The Sobibór uprising which broke out on 14 October 1943 was, on the one hand, one of the most remarkable acts of Jewish resistance during WW2, next to the rising in the Warsaw ghetto and the revolt in the Treblinka death camp. On the other hand, it drove Heinrich Himmler’s decision to launch the extermination of all Jewish prisoners of Majdanek and the labour camps in Trawniki and Poniatowa for “security-keeping” reasons. 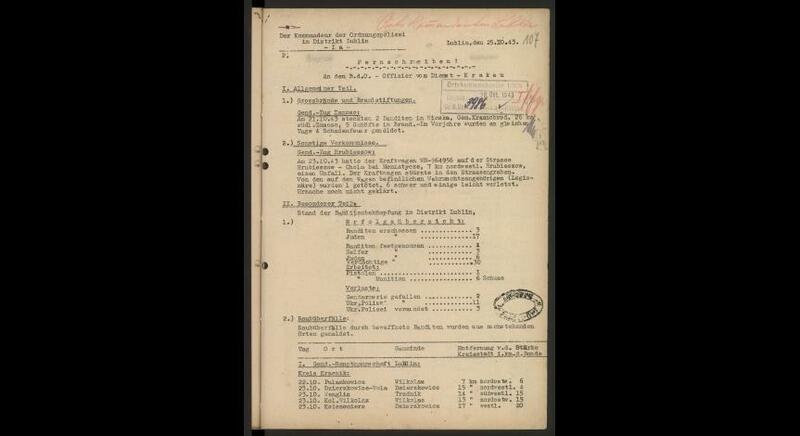 This plan was codenamed Aktion Erntefest and claimed 42,000 Jewish lives between 3 and 4 November 1943 only. 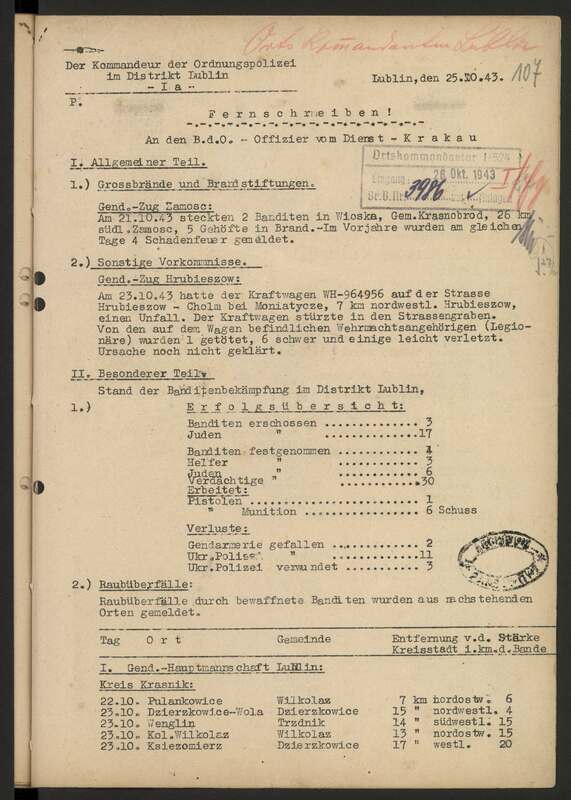 The documents discussed below come from the State Archives in Lublin. These are excerpts from daily reports drawn up by the Kommandeur der Ordnungspolizei im Distrikt Lublin (Commander of the Ordnungspolizei in Lublin District, team 518, Ortskommandantur I/524, ref. 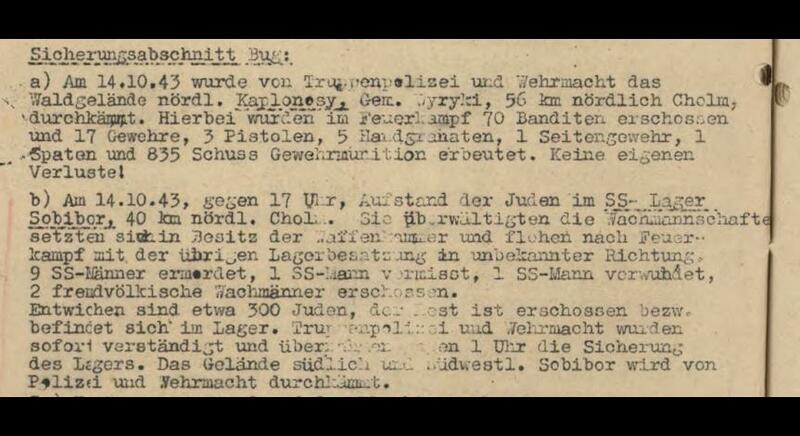 number 18-19) and a situation report submitted by the Commander of the 3rd Mounted SS-Police Unit in Chełm concerning his unit’s participation in the chase after the Sobibór escapees (team 514, 3rd Mounted SS-Police Unit in Chełm [SS-Polizei Reiter Abteilung III in Cholm 1941-1944]). 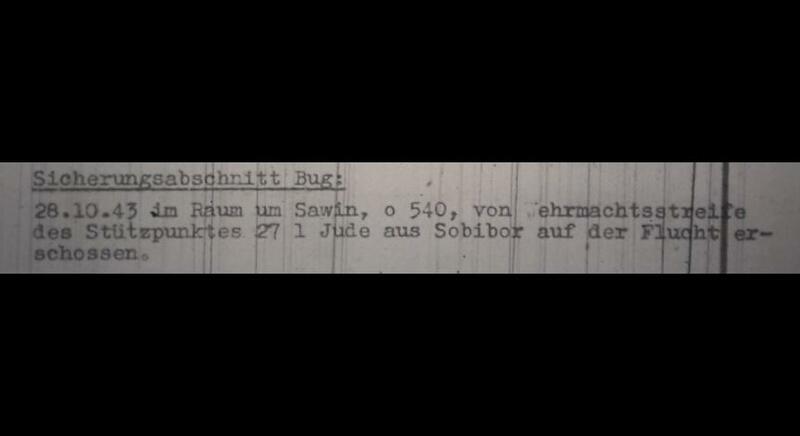 They contain records of action taken by the German police against the runaways from the death camp in Sobibór in October 1943. In later reports, such records do not appear any longer. 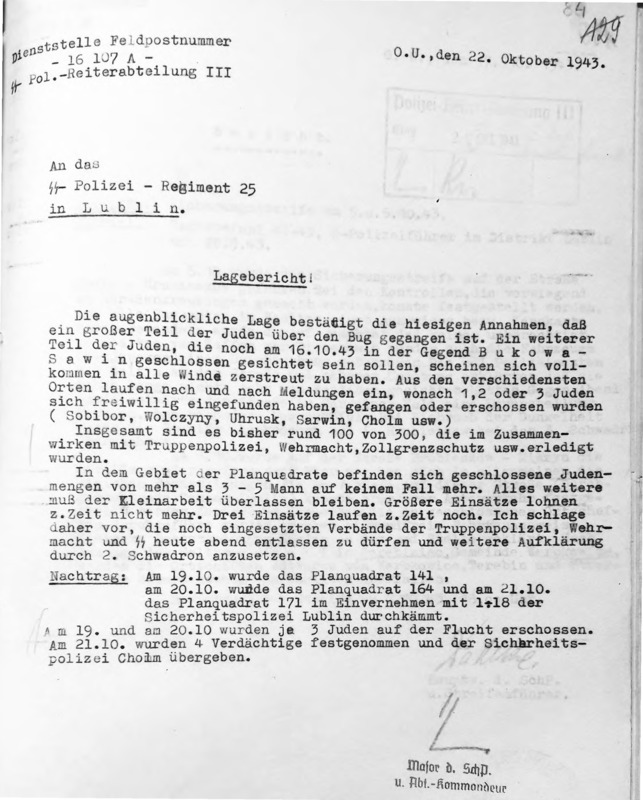 It is worth noting that the first report uses the German term Aufstand, meaning “uprising”, which shows the significance attached to the event. 14 October 1943, at about 17:00 hours, uprising [Ger. Aufstand] of the Jews in the Sobibór SS-camp, 40 km north of Chełm. They overpowered the guard detail and fled in an unknown direction after an exchange of gunfire with the rest of the camp personnel. Nine SS-men murdered, one SS-man missing, two foreign guards shot. 5A. 21 October, in the area of ​​Adampol, 46 km north of Chełm, five Jews from Sobibór were shot by troops from the Wehrmacht base. The current situation seems to confirm our assumptions that a large part of the Jews have crossed the Bug river. Another part of the Jews, who were supposed to be kept in confinement in the area of ​​Bukowa-Sawin on 16 October 1943, is now completely dispersed all over the area. 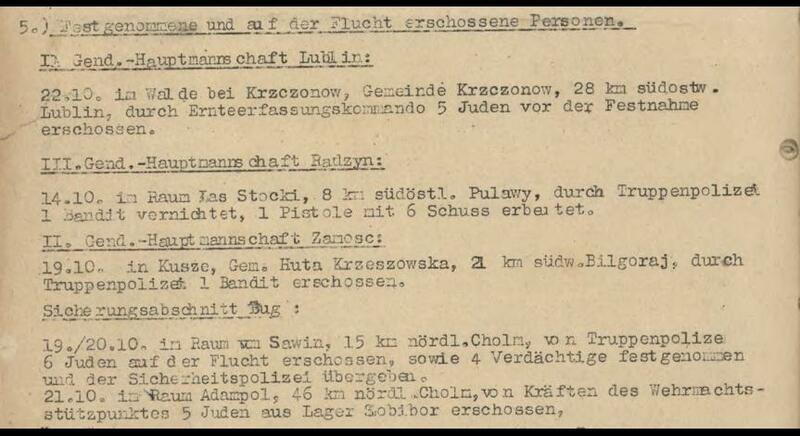 We are receiving reports from various locations which say that one, two, or three Jews turned themselves in, were captured, or shot (Sobibór, Wołczyny, Uhrusk, Sawin, Chełm, etc.). 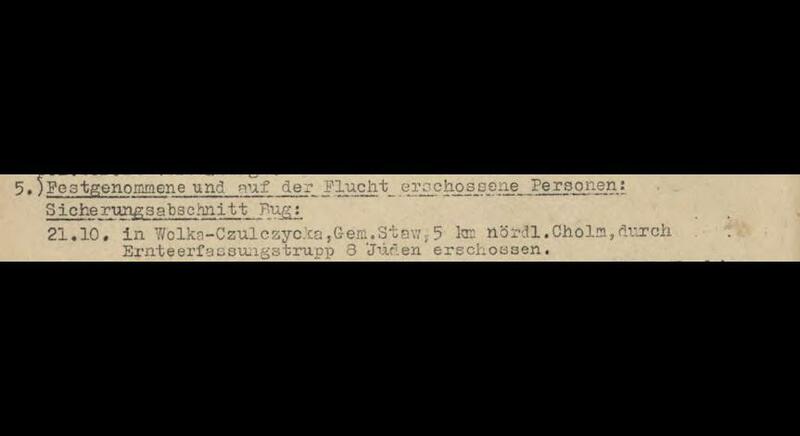 Until now, thanks to the cooperation with the Military Police [Truppenpolizei], Wehrmacht, Border Guards [Zollgrenzschutz], etc., a total of 100 out of 300 escaped Jews have been liquidated. In the search areas, no more than 3 to 5 Jews are still there to be captured, no more. Besides, everything else is an arduous work to do. Major search operations are no longer reasonable at the moment. Three are still underway. Therefore, I propose that the active units of the Military Police, the Wehrmacht and the SS be released, and the second squadron continued reconnaissance. on 20 October, are 164 was combed, and on 21 October, area 171 in collaboration with 1.18 Security Police in Lublin. On 19 and 20 October, three Jews were shot during an escape attempt. 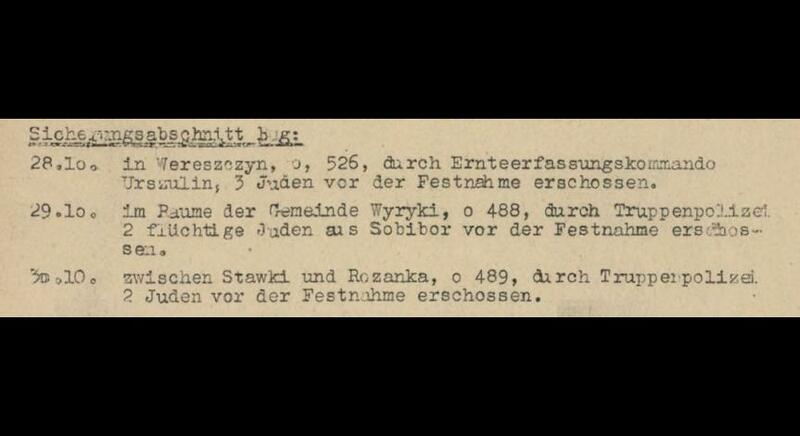 28 October, in the village of Wereszyn..., three Jews were shot before being arrested by the Harvest Protection Unit [Ernteerfassungstrupp] from Urszulin. 29 October, in the area of ​​Wyryki Municipality..., two escaped Jews from Sobibór were shot by the Military Police [Truppenpolizei] before arrest. 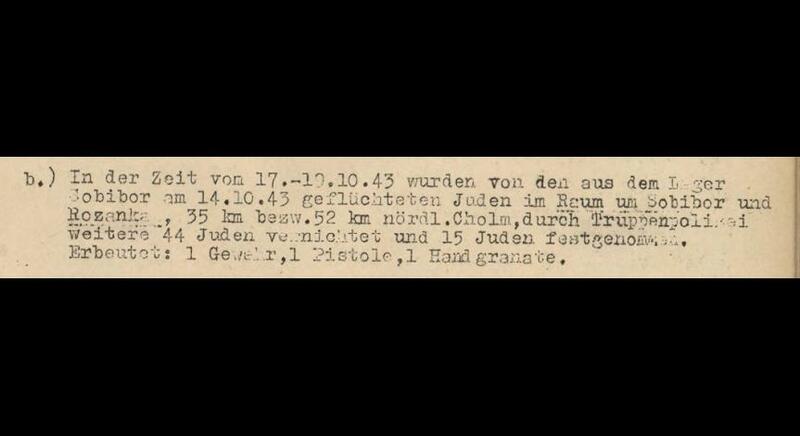 30 October, between Stawki and Rozanka..., two Jews were shot by the Military Police [Truppenpolizei] before arrest.